Rabat- After mocking Morocco’s 2026 World Cup bid logo, social media users have expressed fresh disappointment at a new music video, “Malhama: Abtal Al Watan” (A Saga: Heroes of the Nation), dedicated to Morocco's bid to host the 2026 World Cup. Rabat- After mocking Morocco’s 2026 World Cup bid logo, social media users have expressed fresh disappointment at a new music video, “Malhama: Abtal Al Watan” (A Saga: Heroes of the Nation), dedicated to Morocco’s bid to host the 2026 World Cup. The initiative is also intended to encourage Morocco’s Atlas Lions, who will play their first match in the World Cup June 15. Participants in the clip include singers Abderrahim Souiri, Tahour, Abdelali Anouar, Rachida Talal, Aicha Tachinouite; rising singer Hamza Labyed; model Leila Haddioui; actor Mohamed El Jem; and actress and former Minister of Culture Touria Jabrane. 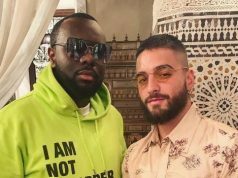 Actor Said Naciri produced the music video. Naciri defended the ridiculed clip with a statement equivalent to the French saying “Chassez le naturel, il revient au galop,” and the English proverb “What’s bred in the bone will come out in the flesh,”referring to that which is inherent to a person’s nature. Vous avez vu cette mal7ama pour une qualif en Coupe du Monde? Imaginez maintenant ce que ça serait si on gagne l’organisation de 2026. On aura des mal7amates pendant 8 ans ! In January, Morocco’s World Cup bid Committee unveiled the long-awaited official logo, garnering mockery, criticism, and disappointment from many Moroccans. According to the Maghreb Arab Press (MAP), the logo reflects the country’s national unity and plural identity. “I could have done a better logo at home and on my computer. This is an important matter, and I don’t think hiring amateurs is a wise thing to do. International marketing firms are highly recommended. 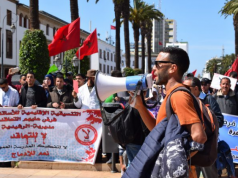 Not a good start, as far as I am concerned,” one Facebook user, Zachary M. Lahlou, expressed to Morocco World News online. “It looks so unprofessional, I wouldn’t spend a single dollar on such a low quality logo! It’s rubbish and it doesn’t make any sense to me! A great nation with a centuries-old culture was represented by a green pentagram with a few red leaves around it? Seriously!” another one expressed, joining the many people noting the absence of creativity in the management and design.